Timm's The BMW M60 M62 and M62TU Engine Scary noises from the top end If you have any of the problems below, read on! • Tapping noises from the rocker covers • Very scary rattling at start-up • A V8 that sounds like a diesel • Heavy knocking under acceleration The modern BMW V8 can make some horrible noises My first BMW V8 was a 1993 730i fitted with the M60B30. Compared to the M30 and M10 engines that I was used to it made some pretty scary noises. I was convinced that it was going to expire at any moment, especially the top end which sounded awful when the acoustic cover was removed. However, my M60 engine lasted another 60,000 miles in my ownership and is still going today. The noises were perfectly normal, and I have heard the same noises on each of my subsequent V8's (I've owned six now). That's not to say some noises aren't serious, because they can be, and it is the aim of this section to sort out which noises need immediate action, and which are perfectly normal. 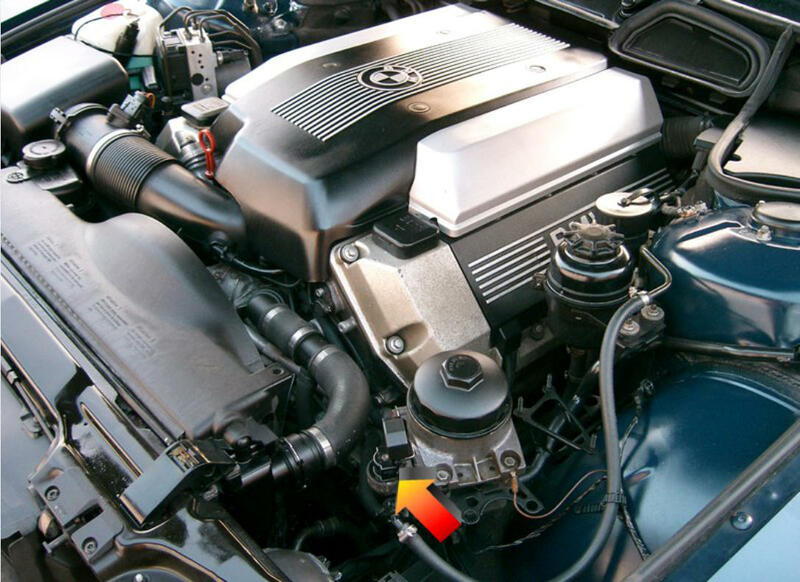 The BMW V8 valve train - the source of the noises Tapping noises The new BMW V8 used a valve system without rockers, often a source of ticking noises due to the small clearance required between the camshaft and rocker. Instead of a rocker, the camshafts sit directly above the valves and between the two are hydraulic lifters as shown below: Eight of the 32 valves and one of the four camshafts employed on the M60/M62 The lifter on the left shows the contact point to the valve, the flat top on the right is depressed by the camshaft The hydraulic tappet can be seen under the cam lobe on this M62B44 engine - no rockers or tappets here! The hydraulic lifter comprises an inner and outer section, the inner section slides within the outer section to close tolerances to provide a oil- tight fit. Between the two parts is a spring that extends the lifter to its full length. Without oil between the two parts it is easy to compress the two together and reduce the length. When oil is introduced, the lifter can't be compressed - and this is how the lifter works to connect the cam lobe movement to the valve. This allows the cam-to-valve clearance to be effectively zero and to provide the highest lift of each valve for a given cam-lobe profile. The other great benefit is that there is no tappet noise, this is because there is no clearance between the cam and the follower as there is when rockers are employed. However, if oil is lost from the lifter, it makes an awful racket. Fortunately, losing oil from a lifter is usually only temporary, and there is a routine that can bleed the lifter so that it is soon quiet again. The lifter can lose oil in a few circumstances, if the engine oil level is low, if the oil is too viscous or if the car is only used for short journeys where the oil fails too reach temperature. It is extremely rare for a lifter to fail. Tapping that isn't from the engine One confusing tapping noise on the E38 comes from the fuel tank ventilation valve which lives here: It sounds quite like a tappet, but only starts chattering away after a couple of minutes of running. To rule this out, it can be disconnected for a short test. It's purpose is to draw out the fuel vapour from the fuel tank charcoal canister which is burned during normal combustion. The tapping noise is slightly faster than a tappet would be a tick-over. Some valves are noisier than others, but the tapping noise is quite normal and nothing to worry about. Slapping, rattling and other scary noises during a cold-start These are the sort of noises that cause palpitations first thing in the morning. And, they are ones you need to take notice of. The reason for this is that the timing chain tensioner may be failing, and when the tensioner fails, the timing chain guides can be damaged which can lead to extensive engine damage. M62TUB44, the red denotes the timing-chain guides, the blue indicates the tensioner The picture above shows the M62TUB44 with the timing-chain covers removed, the red indicates the timing-chain guides. The left guide is pivoted at the lower end, and the timing-chain tensioner (bordered in blue) provides pressure at the top end. In the view above, the crankshaft and camshafts rotate clockwise. Close-up of the timing-chain tensioner when disassembled, from left to right, cylinder, spring and piston The timing-chain tensioner shown above works in a similar way to the hydraulic lifters, the internal spring provides enough pressure to move the piston outwards and allow oil into the cylinder. It is not the spring tension that provides pressure on the timing-chain guide, it is the hydraulic action that holds the piston in a fixed position. As the timing-chain rotates, the pressure on the chain constantly changes as each cam lobe passes the lifters - if just a spring was employed, the left-hand guide would be constantly moving - and areas of slack will appear along the length of the chain. It is this slack that causes noises, and it is the movement that causes damage to the timing-chain guides. With a fully-functioning tensioner any slack is taken up by the spring moving the piston outwards, as the piston moves outwards the cavity is filled with oil and this stops the piston moving inwards again. 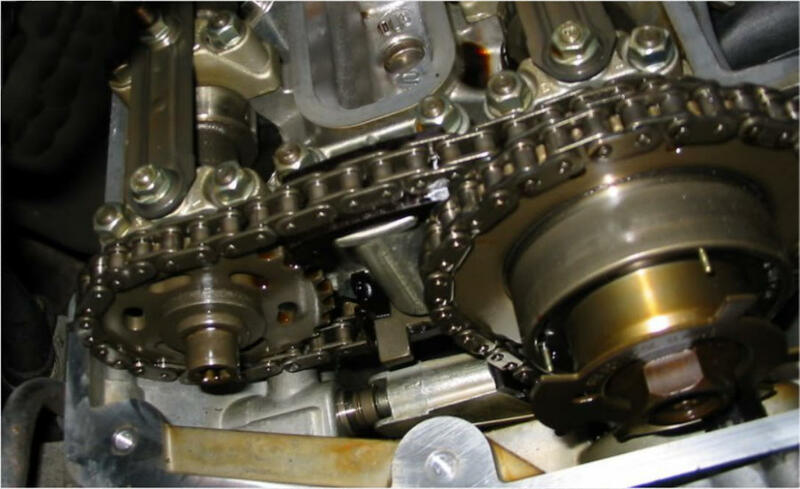 Using this process, the timing chain remains tight along the full length. 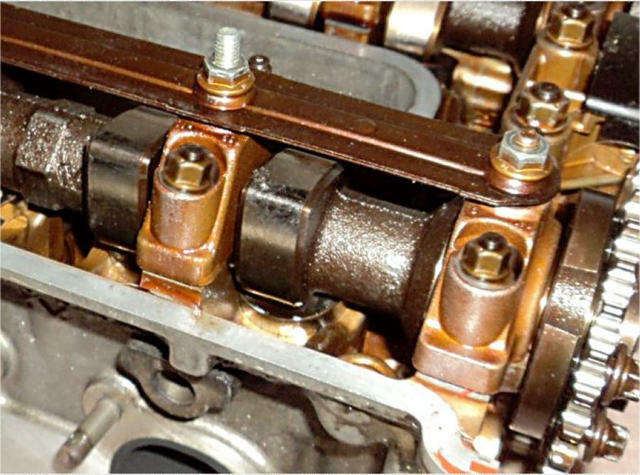 The problem occurs when: • Old oil solidifies inside the tensioner and the piston fails to move outwards to take up slack • The tensioner piston and cylinder wears, this stops the damping action and allows the chain to slap Both of the faults above will eventually lead to damage to the timing chain guides. The engine will sound noisy with hissing, rattling and tapping noises, quite often (on the M62TUB) an error code for the Vanos timing will be present. Fortunately, replacement of the timing chain tensioner is pretty easy and cheap to perform - as long as it is done in good time. If the tensioner has not been replaced by 100,000 miles it's time to do it. Is that a diesel engine in your 740i? The M62TUB44 is a brilliant engine, loads of low-end grunt, top-end power and excellent economy - the only problem is that as they get on in miles, they start sounding like a diesel. Fortunately, unlike a failing timing chain tensioner, the noise doesn't warn of impending doom. The large lump at the front of this M62TUB44 is the Vanos unit which adjusts the timing of the inlet camshaft The picture above shows what is under the rocker covers of bank 1 of the M62TUB44. To the right, on the inlet camshaft is the Vanos unit. Rather than the sprocket being bolted to the camshaft (as it is on the exhaust camshaft), the sprocket is mounted on concentric hollow shafts - the rotational drive being transmitted by helical gears. A helical gear on the Vanos unit of a M62TUB44. The rotational drive is transmitted by gear-pairs The Vanos unit is quite complex, simply put, the sprocket has a helix gear as does the shaft that is bolted to the camshaft. A third concentric part has both internal and external helix gears which mesh with both the sprocket and camshaft gears. By moving this part forwards and backwards, the rotational alignment of the sprocket and camshaft can be altered - and this alters the inlet camshaft timing. 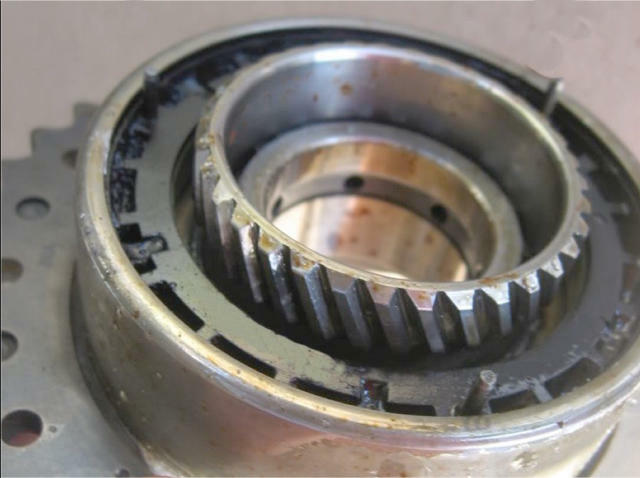 There is always a slight clearance between the helix gear-pairs - and this clearance is taken up by oil which is contained by Teflon and Viton seals between the moving parts. As long as the oil is maintained between the gears, the system is noiseless - but once the seals wear and start failing, the oil is not maintained between the gears and the gears will move in relation to each other and this is the source of the noise. Once there is rotational play, as the camshaft pushes down on a valve-lifter, the torque required will retard the helical gear. As the cam passes the lifter, the load reverses and the gear will advance slightly. This rotational movement of the inner helical gears in respect to the outer helical gears is the source of the noise. The diesel-like sound is the helical gear pairs moving in relation to each other as each cam moves over the lifters. The good news is that although the Vanos noise is horrible, it doesn't mean that it is going to fail. My 740i had Vanos noise for well over 50,000 miles with no deterioration of performance. Once the car has done 100,000 miles or so, the Vanos noise is going to be making itself known. Changing the grade of the engine oil will help a bit, but not much. There are two methods of repair - change the Vanos units, or change the Vanos seals. I have seen one 740i with replacement Vanos units and it was whisper quiet, but it is a big job, and probably only financially viable using DIY methods - at BMW it will cost around £2500 (a Vanos pair is £750 on their own), and not much less at an independent. The other method of repair is to replace the seals and o-rings, but, the outer perimeter o-ring cannot be reached and a modification needs to be made to fit a seal in an alternative position. The replacement procedure is very complicated and I have not heard of any owners that have done this job so I cannot comment on it. The procedure can be found here from Besian systems. Heavy knocking under acceleration In older BMW engines, using fuel with too low an octane (AKI) could cause knocking (also known as detonation, pinking or pre-ignition) under harsh acceleration. The M60 introduced knock sensors to monitor the onset of knocking, at which point the ECU would retard the ignition timing to stop this happening. This system allows the engine to run on fuels with a low octane, but also allows the engine to utilise the fuel fully by advancing the ignition timing when higher octane fuel is used. One other benefit is to allow the ECU to lean the fuel mixture for greater economy, leaning the mixture too far will cause knocking, but the sensors detect this and the mixture can be enriched. In most situations, the knock sensors will stop knocking occurring, but there are limitations. One of the main limitations is that there is only one MAF and two exhaust pipes! The airflow through the MAF determines the base-line injector dwell (the amount of fuel injected) into each cylinder - and the mixture is tightly controlled - except when there is more air available in one cylinder bank compared to the other. The short and long-term fuel trims can compensate to a certain degree per cylinder bank, but where there is a large disparity the system fails to cope. There is one problem that can cause a large airflow disparity, and that is if one catalytic converter has failed and has blocked the flow of exhaust gasses. In this situation, one cylinder bank runs rich, and the other bank runs lean. Depending on how restricted one exhaust is, the air/fuel ratio can be a long way from ideal. Catalytic converters can both melt and restrict gas flow, or (more often), disintegrate and block the exhaust system at the resonator or back boxes. Fortunately, there is a simple test for a blocked exhaust and that is to remove the pre-cat Lambda sensors and measure the exhaust pressure while the car is running, the blocked side will have a much greater back-pressure. To start with, the knocking will only be under harsh acceleration, as the converter blocks the gas flow to a greater extent this will allow the engine to knock under light acceleration. A quick and easy test (well, apart from trying to remove the Lambda sensors), is to run the car with the Lambda sensors removed as this allows the exhaust gasses to escape and reduce the back-pressure. If the engine stops knocking and power is increased then you can be sure the exhaust is restricted. Timm's The BMW M60 M62 and M62TU Engine Scary noises from the top end If you have any of the problems below, read on! • Tapping noises from the rocker covers • Very scary rattling at start-up • A V8 that sounds like a diesel • Heavy knocking under acceleration The modern BMW V8 can make some horrible noises My first BMW V8 was a 1993 730i fitted with the M60B30. Compared to the M30 and M10 engines that I was used to it made some pretty scary noises. I was convinced that it was going to expire at any moment, especially the top end which sounded awful when the acoustic cover was removed. However, my M60 engine lasted another 60,000 miles in my ownership and is still going today. The noises were perfectly normal, and I have heard the same noises on each of my subsequent V8's (I've owned six now). That's not to say some noises aren't serious, because they can be, and it is the aim of this section to sort out which noises need immediate action, and which are perfectly normal. The BMW V8 valve train - the source of the noises Tapping noises The new BMW V8 used a valve system without rockers, often a source of ticking noises due to the small clearance required between the camshaft and rocker. Instead of a rocker, the camshafts sit directly above the valves and between the two are hydraulic lifters as shown below: Eight of the 32 valves and one of the four camshafts employed on the M60/M62 The lifter on the left shows the contact point to the valve, the flat top on the right is depressed by the camshaft The hydraulic tappet can be seen under the cam lobe on this M62B44 engine - no rockers or tappets here! The hydraulic lifter comprises an inner and outer section, the inner section slides within the outer section to close tolerances to provide a oil- tight fit. Between the two parts is a spring that extends the lifter to its full length. Without oil between the two parts it is easy to compress the two together and reduce the length. When oil is introduced, the lifter can't be compressed - and this is how the lifter works to connect the cam lobe movement to the valve. This allows the cam-to-valve clearance to be effectively zero and to provide the highest lift of each valve for a given cam-lobe profile. The other great benefit is that there is no tappet noise, this is because there is no clearance between the cam and the follower as there is when rockers are employed. However, if oil is lost from the lifter, it makes an awful racket. Fortunately, losing oil from a lifter is usually only temporary, and there is a routine that can bleed the lifter so that it is soon quiet again. The lifter can lose oil in a few circumstances, if the engine oil level is low, if the oil is too viscous or if the car is only used for short journeys where the oil fails too reach temperature. It is extremely rare for a lifter to fail. Tapping that isn't from the engine One confusing tapping noise on the E38 comes from the fuel tank ventilation valve which lives here: It sounds quite like a tappet, but only starts chattering away after a couple of minutes of running. To rule this out, it can be disconnected for a short test. It's purpose is to draw out the fuel vapour from the fuel tank charcoal canister which is burned during normal combustion. The tapping noise is slightly faster than a tappet would be a tick-over. Some valves are noisier than others, but the tapping noise is quite normal and nothing to worry about. Slapping, rattling and other scary noises during a cold-start These are the sort of noises that cause palpitations first thing in the morning. And, they are ones you need to take notice of. The reason for this is that the timing chain tensioner may be failing, and when the tensioner fails, the timing chain guides can be damaged which can lead to extensive engine damage. M62TUB44, the red denotes the timing-chain guides, the blue indicates the tensioner The picture above shows the M62TUB44 with the timing-chain covers removed, the red indicates the timing-chain guides. The left guide is pivoted at the lower end, and the timing-chain tensioner (bordered in blue) provides pressure at the top end. In the view above, the crankshaft and camshafts rotate clockwise. Close-up of the timing-chain tensioner when disassembled, from left to right, cylinder, spring and piston The timing-chain tensioner shown above works in a similar way to the hydraulic lifters, the internal spring provides enough pressure to move the piston outwards and allow oil into the cylinder. It is not the spring tension that provides pressure on the timing-chain guide, it is the hydraulic action that holds the piston in a fixed position. As the timing-chain rotates, the pressure on the chain constantly changes as each cam lobe passes the lifters - if just a spring was employed, the left-hand guide would be constantly moving - and areas of slack will appear along the length of the chain. It is this slack that causes noises, and it is the movement that causes damage to the timing-chain guides. With a fully-functioning tensioner any slack is taken up by the spring moving the piston outwards, as the piston moves outwards the cavity is filled with oil and this stops the piston moving inwards again. 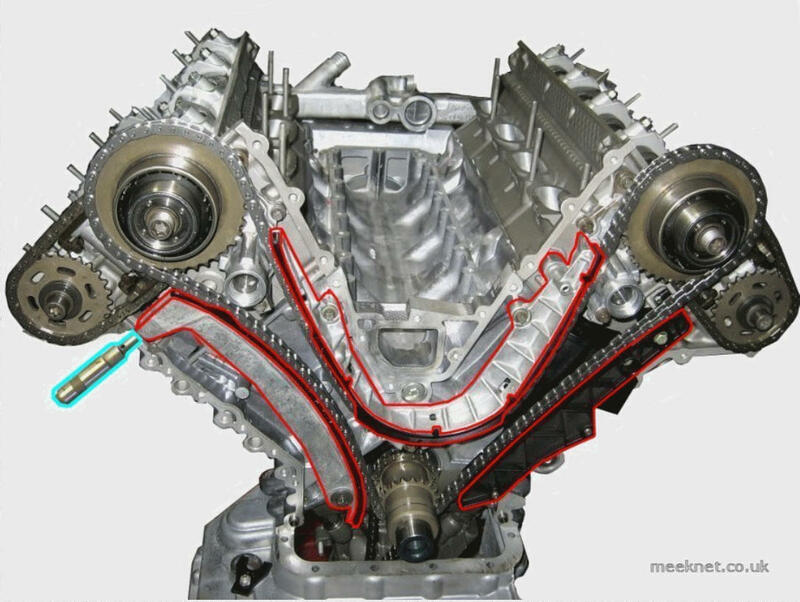 Using this process, the timing chain remains tight along the full length. The problem occurs when: • Old oil solidifies inside the tensioner and the piston fails to move outwards to take up slack • The tensioner piston and cylinder wears, this stops the damping action and allows the chain to slap Both of the faults above will eventually lead to damage to the timing chain guides. The engine will sound noisy with hissing, rattling and tapping noises, quite often (on the M62TUB) an error code for the Vanos timing will be present. Fortunately, replacement of the timing chain tensioner is pretty easy and cheap to perform - as long as it is done in good time. If the tensioner has not been replaced by 100,000 miles it's time to do it. Is that a diesel engine in your 740i? The M62TUB44 is a brilliant engine, loads of low-end grunt, top-end power and excellent economy - the only problem is that as they get on in miles, they start sounding like a diesel. Fortunately, unlike a failing timing chain tensioner, the noise doesn't warn of impending doom. 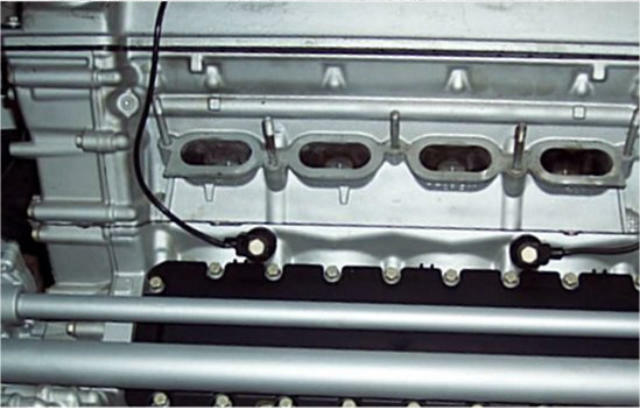 The large lump at the front of this M62TUB44 is the Vanos unit which adjusts the timing of the inlet camshaft The picture above shows what is under the rocker covers of bank 1 of the M62TUB44. To the right, on the inlet camshaft is the Vanos unit. Rather than the sprocket being bolted to the camshaft (as it is on the exhaust camshaft), the sprocket is mounted on concentric hollow shafts - the rotational drive being transmitted by helical gears. A helical gear on the Vanos unit of a M62TUB44. The rotational drive is transmitted by gear-pairs The Vanos unit is quite complex, simply put, the sprocket has a helix gear as does the shaft that is bolted to the camshaft. A third concentric part has both internal and external helix gears which mesh with both the sprocket and camshaft gears. By moving this part forwards and backwards, the rotational alignment of the sprocket and camshaft can be altered - and this alters the inlet camshaft timing. There is always a slight clearance between the helix gear-pairs - and this clearance is taken up by oil which is contained by Teflon and Viton seals between the moving parts. As long as the oil is maintained between the gears, the system is noiseless - but once the seals wear and start failing, the oil is not maintained between the gears and the gears will move in relation to each other and this is the source of the noise. Once there is rotational play, as the camshaft pushes down on a valve- lifter, the torque required will retard the helical gear. As the cam passes the lifter, the load reverses and the gear will advance slightly. This rotational movement of the inner helical gears in respect to the outer helical gears is the source of the noise. The diesel-like sound is the helical gear pairs moving in relation to each other as each cam moves over the lifters. The good news is that although the Vanos noise is horrible, it doesn't mean that it is going to fail. My 740i had Vanos noise for well over 50,000 miles with no deterioration of performance. Once the car has done 100,000 miles or so, the Vanos noise is going to be making itself known. Changing the grade of the engine oil will help a bit, but not much. There are two methods of repair - change the Vanos units, or change the Vanos seals. I have seen one 740i with replacement Vanos units and it was whisper quiet, but it is a big job, and probably only financially viable using DIY methods - at BMW it will cost around £2500 (a Vanos pair is £750 on their own), and not much less at an independent. The other method of repair is to replace the seals and o-rings, but, the outer perimeter o-ring cannot be reached and a modification needs to be made to fit a seal in an alternative position. The replacement procedure is very complicated and I have not heard of any owners that have done this job so I cannot comment on it. The procedure can be found here from Besian systems. Heavy knocking under acceleration In older BMW engines, using fuel with too low an octane (AKI) could cause knocking (also known as detonation, pinking or pre-ignition) under harsh acceleration. The M60 introduced knock sensors to monitor the onset of knocking, at which point the ECU would retard the ignition timing to stop this happening. This system allows the engine to run on fuels with a low octane, but also allows the engine to utilise the fuel fully by advancing the ignition timing when higher octane fuel is used. One other benefit is to allow the ECU to lean the fuel mixture for greater economy, leaning the mixture too far will cause knocking, but the sensors detect this and the mixture can be enriched. In most situations, the knock sensors will stop knocking occurring, but there are limitations. One of the main limitations is that there is only one MAF and two exhaust pipes! The airflow through the MAF determines the base-line injector dwell (the amount of fuel injected) into each cylinder - and the mixture is tightly controlled - except when there is more air available in one cylinder bank compared to the other. The short and long-term fuel trims can compensate to a certain degree per cylinder bank, but where there is a large disparity the system fails to cope. There is one problem that can cause a large airflow disparity, and that is if one catalytic converter has failed and has blocked the flow of exhaust gasses. In this situation, one cylinder bank runs rich, and the other bank runs lean. Depending on how restricted one exhaust is, the air/fuel ratio can be a long way from ideal. Catalytic converters can both melt and restrict gas flow, or (more often), disintegrate and block the exhaust system at the resonator or back boxes. Fortunately, there is a simple test for a blocked exhaust and that is to remove the pre-cat Lambda sensors and measure the exhaust pressure while the car is running, the blocked side will have a much greater back-pressure. To start with, the knocking will only be under harsh acceleration, as the converter blocks the gas flow to a greater extent this will allow the engine to knock under light acceleration. A quick and easy test (well, apart from trying to remove the Lambda sensors), is to run the car with the Lambda sensors removed as this allows the exhaust gasses to escape and reduce the back-pressure. If the engine stops knocking and power is increased then you can be sure the exhaust is restricted.